Spring is here which means preparing lighter meals with some of its early bounty! Mackerel can stand up to subtle or bold flavors. In this case I went with a focus on Spring flavors. I went to Burhops in Plaza Del Lago and ordered up a Mackerel filleted, skinned and deboned. Try this recipe and enjoy! skinned and deboned, seasoned with salt and pepper. Place vegetables on parchment paper and top with mackerel and generous amounts of dill. Cover with lemon slices and chives. Add a pinch of salt and pepper and drizzle with a bit of olive oil. 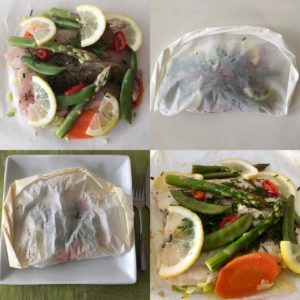 Close the papillote* and bake for 15 minutes. Remove from bake sheet with spatula and place on dinner plates. Open papillote with a steak knife or shears. Careful as hot steam will release along with the wonderful aroma. Fold a 15 x18″ piece of parchment paper in half. Using kitchen shears cut the parchment into a heart shape. Arrange vegetables and herbs on one side of the paper. Top with fish. Add olive oil or butter and a splash of wine and/or broth to keep the fish moist and create a sauce. Season with salt and pepper. Working from one end, begin tightly folding the open edge of the paper. Continue folding the paper’s open edge to form a seal. Transfer the packet to a rimmed baking sheet and bake.